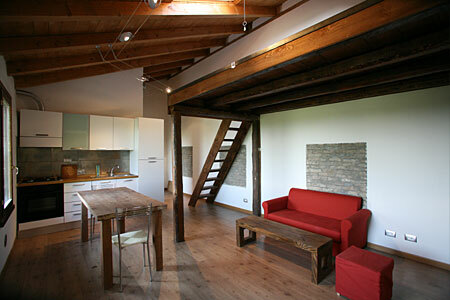 home > agritourism > the apartments > flat "Colombo"
Comfortable, warm, and particularly harmonious. A very high ceiling (average height of 3.80 m) in which the main room is prepared with an equipped kitchen area and a couch. There is a bedroom and a bathroom with beatiful finishes (marble sink and designed accessories) and a solid wooden loft 15 sq. meters, that is useful as a second chamber or as a study or work area.